Untapped T&AMP;D measurement data could make the difference on reliability. Performing long-term planning for power systems that are typically operating above capacity. 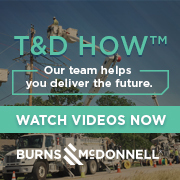 While utility executives must take into account the interaction and dynamics of connected RTOs and ISOs, their decisions generally are dictated by certain underlying beliefs of the current condition of their transmission and distribution (T&AMP;D) system components and their failure rates. The problem is that these condition assessments usually are based on historical trends of failure rates and maintenance expenses that are assumed will continue in the future.